I was photographing the sunburst coming through the globe at 59th street in Columbus Circle with a 100mm Canon macro lens. 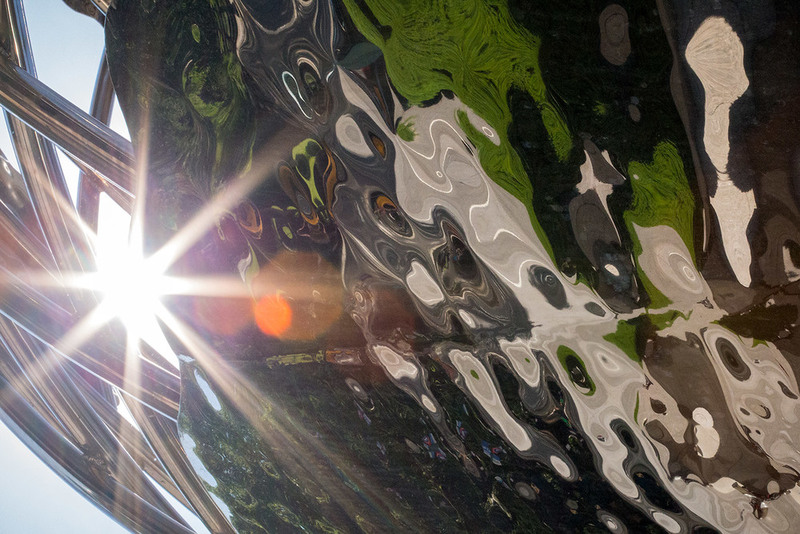 The brilliant patterns on the shiny surface are reflections from the surrounding area. Pleased with the results, I took many frames, each with a slightly different composition. After about 10 shots, I looked away for a moment to check the results in the LCD screen. Just then, none other than Rod Stewart walked by. At first I wasn't sure, but that hair is an absolute giveaway. It hasn't changed in 20+ years! I enjoy his music, but clearly this was no time for making a fuss. In Manhattan, celebrity sightings are not a big deal, right? I took a quick record shot, and headed on my way.